I'm not sure quite where I would be without a cupboard full of herbs and spices, you can really boost the flavour of any dish. Sometimes the spices are the stars and the other ingredients are the supporting act. 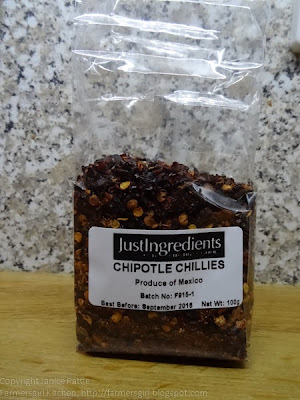 This is one of those dishes and in the starring role is...(drumroll) Just Ingredients Chipotle Chillies! Just Ingredients have one of the largest ranges of ingredients online, much larger than you will find on the high street or in your local supermarket. From turmeric to oregano, carob to ashwagandha, they stock herbs, spices, powders, oils and tinctures. Their product range is exciting and diverse and with a quick search, you will be able to come across some interesting finds. All their products are non-irradiated and GMO free. They also supply a number of products suitable for vegan, vegetarian, nut-free and wheat-free diets and have an organic range. 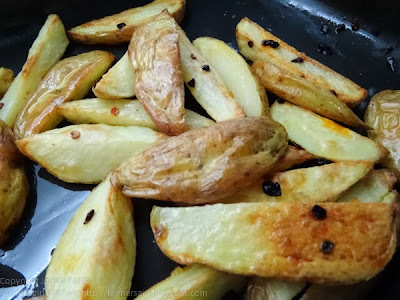 They sent me a parcel of samples to try including this pack of Chipotle Chillies and I turned some everyday potatoes into superstar Chipotle Chilli Wedges. Heat the oven to 200C/400F. 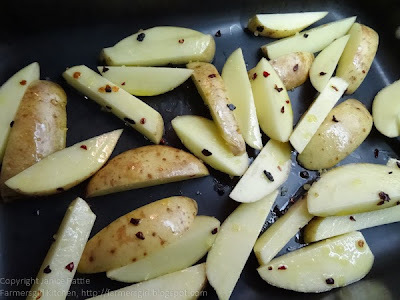 Put the potato wedges and oil in a roasting tray and mix thoroughly, sprinkle over the Chipotle Chillies and bake for 20-25 minutes until golden and crispy. The smoky chilli worked really well with the potato, not too spicy and a lovely smoky flavour, the wedges would be lovely served with a soured cream dip or with grilled meats, burgers or sausages. Chipotle chillies are in fact, fully ripened jalapeno peppers that are smoke dried, they are dark reddish brown to black in colour and bursting with a delightful smokey, slightly chocolaty flavour with a medium heat, registering on the Scoville scale as have 15, 000-25, 000 SHU’s. Just Ingredients chipotle chillies have been heat treated to preserve their freshness and their unique flavour and have been pre-cut to 3-6mm for ease of use. Handle with caution! I was provided with a hamper of spice samples from Just Ingredients to review, I was not paid for this post and all opinions are my own. More spicy recipes coming soon!